It can trace its roots right back to the Hyundai Scoupe from 1990, but by the time the second generation Hyundai Coupe arrived in 2001 it was a much more sophisticated beast. It can trace its roots right back to the Hyundai Scoupe from 1990, but by the time the second generation Hyundai Coupe arrived in 2001 it was a much more sophisticated beast. This time it was not only better looking, with many comparing it to a junior Ferrari, but much more robust as well. It even drove pretty well and came with a choice of engines, though the firm stopped making them back in 2009 so don’t expect anything newer. There hasn’t yet been a convertible Hyundai and, until the recently unveiled Veloster, the Coupe held the crown of the firm’s sportiest model. It’s a handsome thing, with a pleasing mix of curves and sharp details and the second generation model went on to become particularly popular. Two engines were offered, both petrol - a 1.6-litre four-cylinder unit with 105hp and a 2.0-litre four-cylinder with a healthy 140hp. Despite its lowly output the 1.6 still managed 183km/h and a 0-100km/h time of 11.4 seconds thanks to the Coupe’s compact dimensions and relatively low weight. It was no dynamic delight though, the front-wheel drive chassis proving to be capable rather than a benchmark for the sector. Still, both a four-speed auto and a five- or six-speed manual gearbox were offered, and there was the choice of the standard model or plusher FX trim. 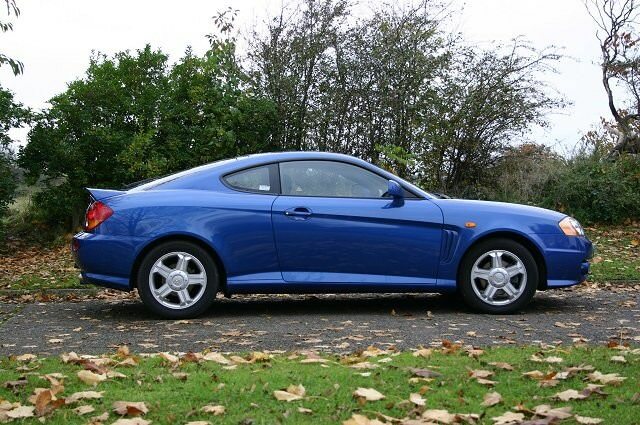 Values of the Hyundai Coupe aren’t especially good, so we’d search out a higher spec FX model, which often came with leather seats and larger alloy wheels. We’d also try and find a manual 2.0-litre (the automatics are rare anyway) as the jump in performance more than makes up for the slight difference in economy and emissions. Try and find a later car too, as the upgraded interior is a bit hardier than that found on the early models. If you want a fun front-wheel drive coupé then best look towards the talented Ford Puma. Otherwise the Hyundai Coupe is a sensible choice - the cabin and boot are spacious enough to be usable for a young family. It’s also pretty good looking, and thanks to low values on the used market something of a bargain too.